What kind of lettuce is that? KALE! Charlotte had kale twice this week! Tim and I both love the leafy green so I was excited she took a liking to it as well. The first introduction to kale was in a sausage and bean stew I like to make in the fall and winter. Charlotte picked the kale out of the bowl and asked “what kind of lettuce is this?”. I was impressed with her food identification, but more thrilled that she liked the superfood. 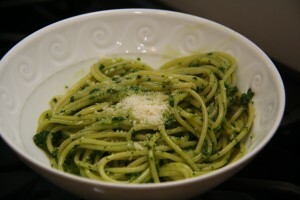 Later in the week, I used kale to make this delicious pesto. Charlotte loved it and ate two bowls. Tim and I devoured ours as well. I followed the directions below and it turned out very well. We have some extra for dinner next week! A sprinkle of extra parmesan on top added a nice touch. Enjoy! Blanch 4 garlic cloves for 2-3 minutes; remove from water with a slotted spoon. In same water, blanch 1 bunch of stemmed kale for 30 seconds; drain. Purée garlic and kale in a food processor; with motor running, gradually add about 3/4 cup extra-virgin olive oil, about 1 cup grated Parmesan, and 1 Tbsp. fresh lemon juice; season with kosher salt and freshly ground black pepper. Use pesto to dress cooked pasta of your choice or as a sauce for vegetables or fish.